Recommendations on a monitor to do photo edits on? Forums › Digital Imaging › Recommendations on a monitor to do photo edits on? So I'm looking at monitors again! I recently got an AOC 2795E, but I really don't like how washed out it is vs my Dell IPS monitor. So I'm wondering what monitors you use for this kind of work? I do a bit of photo editing, but more video editing. A few games here and there, too. It's expensive but worth the investment, my Ultrasharp is getting through it's 6th year and still looks really great. Dell IPS, I use a 23" monitor. I don't really like huge monitors. Calibrated with a Spyder 4 lite. Given that I'm not professional in any regard, I often don't feel spending a tonne is worth it, but I will look into that. I do like the additional space. 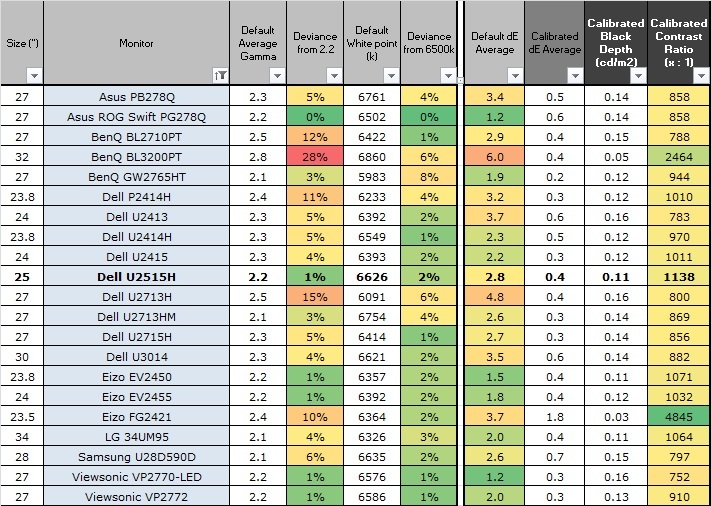 timmmay: Dell IPS, I use a 23" monitor. I don't really like huge monitors. Calibrated with a Spyder 4 lite. I'm already using a Dell IPS 2312M! Love the thing, really. As you say, may get another of the exact same. This is the #1 site IMO for (unbiased) reviews and information on monitors. Unfortunately, not all monitors tested are available in NZ. The reviews are quite extensive. A new Dell Ultrasharp 25" model should be available in NZ soon - 2515H. This tested very well. It's w-LED backlit / standard gamut (sRGB). A summary of some out of box and calibrated colour accuracy for monitors tested is below. There's more to it than that though - one of the best results above is for an Asus gaming monitor with a TN panel, and unsuitable for serious graphics editing. The Eizo monitors may have the same panels as (much) cheaper monitors, but probably have hardware correction of uneven backlight luminance common to LCDs, as well as hardware calibration with internal high bit depth look-up tables etc. (The Eizo monitor which performs poorly there is a gaming rather than graphics monitor). Some monitors will be wLED sRGB gamut, others wide gamut with RGB LED backlight. sRGB vs wide gamut presents several cans of worms wrt photography. Fred99: This is the #1 site IMO for (unbiased) reviews and information on monitors. I'll definitely have a look. As you say, it can be a bit misleading with results for a gaming monitor (TN panel) having good results. The TN I have at the moment is apparently a very nice monitor, but vs the IPS I have, it's really not pleasing to me. I'm quite fussy.